With Halloween just around the corner, Maxwell was recently sent an amazing Morphsuit. Every year ahead of Halloween I always try to find Maxwell the perfect dressing up costume. I always give him the choice of what he would like to dress up. I always like to choose a costume for Maxwell which is not only eye catching but something which will also grow with him and something that is practical. 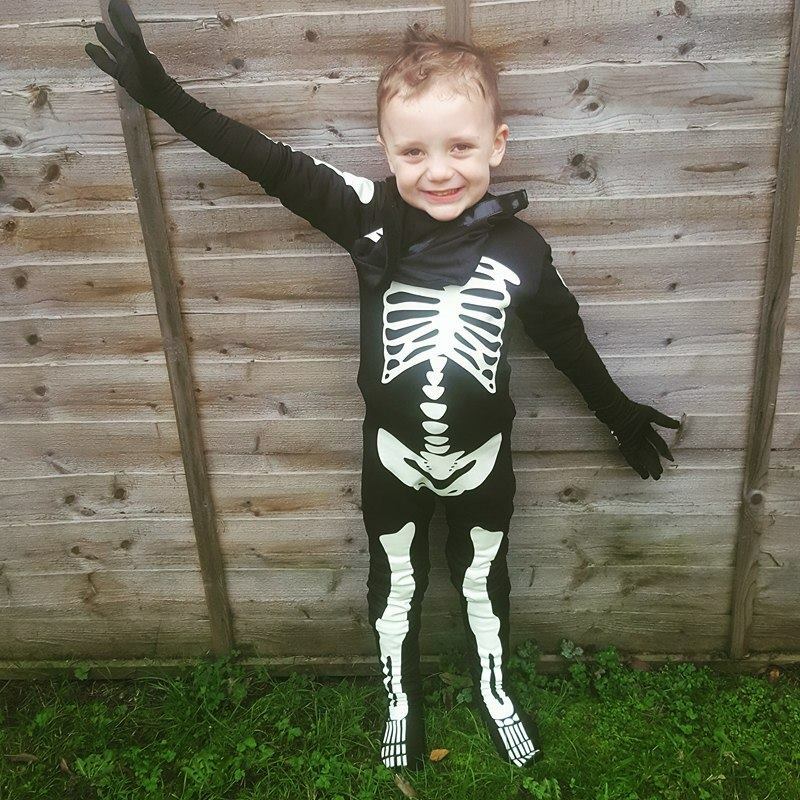 Over the years Maxwell has dressed up as a pumpkin, a skeleton and a wizard and this year Maxwell choose to be a skeleton again. 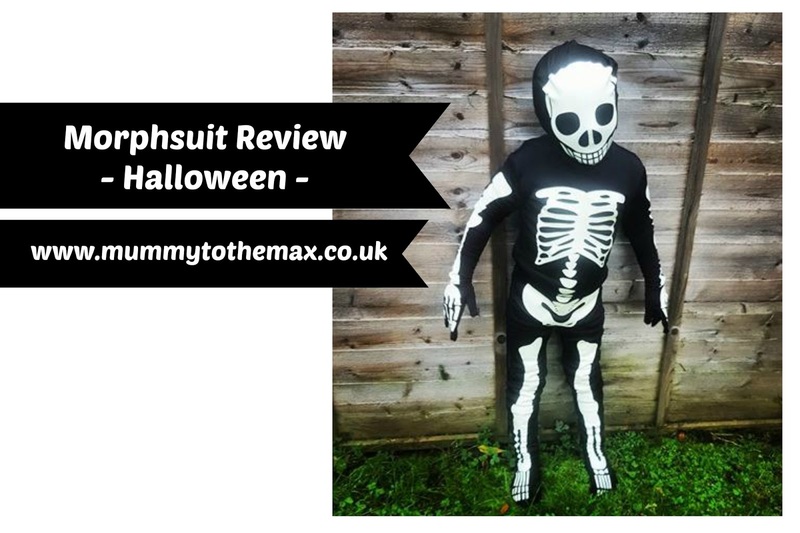 Maxwell was sent the glow in the dark skeleton costume from Morphsuits. The delivery was quick and fuss free and the morphsuit arrived nicely packaged and ready to try on. Maxwell decided to put the suit on straight away and as soon as he had the costume on, both of us were thrilled. The costume looked fantastic and we both felt the costume fitted well. The fit of the costume allowed Maxwell to move freely and allowed him some growing room. Personally we do not go trick or treating however we love to go to Halloween parties and this costume allows some growing room for Maxwell to not only go to this year's parties but to also wear next year. Maxwell was able to wear his own clothes under the costume which meant if he decided to go trick or treating, he would be able to stay warm if he wrapped up in warm layers underneath the costume. We found that the costume had room for Maxwell to wear shoes under it to stop Maxwells feet getting cold however the costume was also great with just socks on if you were going to someones party. We found the costume to be practical. The costume allowed Maxwell to breathe easily and Maxwell was also able to see out of the costume with ease. I was a little worried that Maxwell would hate something so tight over his face however this was not a problem. 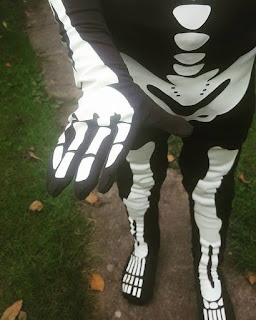 The instructions on the glow in the dark skeleton costume say that you are also able to drink through it, we tried to sip a drink and we found that we were able to do so however Maxwell much prefered removing the head of the costume. Due to going outside in the costume, we decided that the costume could do with a clean. We hand washed the costume and after doing so we allowed it to sit and dry. We found that the costume dried quickly and the costume washed well. We found that the costume did not bubble or change colour. Maxwell is nearly 5 years old and was sent a medium sized costume. Maxwell is quite tall for his age and I felt that the medium costume was a great fit. The costume has some growing room in and I feel that if we were sent a small costume, the costume would have been quite tight around Maxwell's head and not allowed Maxwell to be able to wear any clothing under it. If you are after a jaw dropping costume, Morphsuits are a great pick! You are still able to buy costumes from them in time for Halloween if you pick Express or Express Plus UK Delivery. The Skeleton costume which we were sent is priced at £18.99 which I think is good value for money seeing as you are able use the costume over and over again. Not only do Morphsuits have costumes suitable for children but they also have plenty of costumes for adults. You are able to see their Halloween range here.